The NFL has a serious violence-against-women problem. Two games. 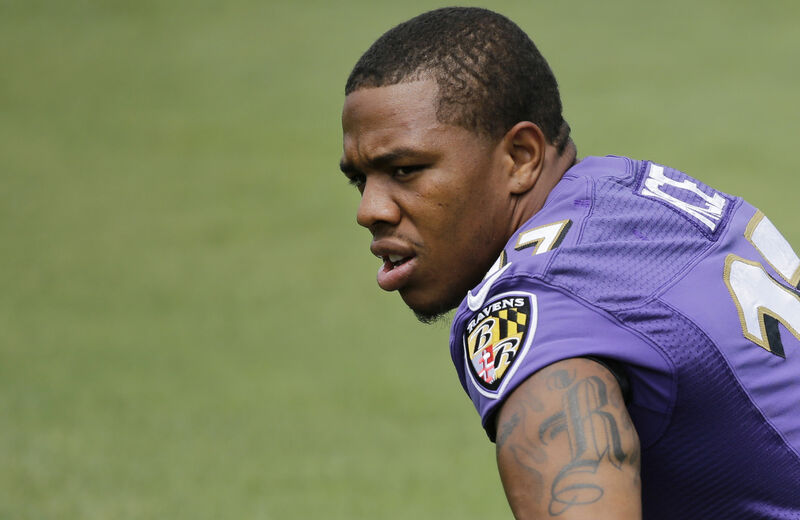 Baltimore Ravens running back Ray Rice was caught on a security camera dragging his unconscious wife-to-be Janay Palmer by the hair, after knocking her unconscious, and the National Football League has chosen to suspend him for two games. Rice in fact will return to the field just in time to wear the NFL’s pink-festooned uniforms to celebrate their deep commitment to breast cancer awareness—and their even deeper commitment to selling sixty-dollar jerseys marketed aggressively to their female fan base. In fact, the Ray Rice all-pink number is available for purchase right now. The NFL actually needs a Violence Against Women Month instead, to raise awareness about a killer that malignantly throbs in every locker room. But that is not going to happen, and it is worth understanding why. The NFL, as many have been writing for too many years, has a violence-against-women problem. The incidents are too many to catalogue. But by suspending Ray Rice for two games, a lighter suspension than the league’s marijuana smokers receive, Roger Goodell and his coterie of owners are sending a message that it just doesn’t matter. I don’t know why anyone would expect more from a league notorious for racist nicknames, out-of-control owners and a locker-room culture that would shame some high schools. But still. Two games. I did not think the NFL had the capacity to stun me with its blockheadedness, but I was wrong. There is without question an important discussion to have—an unheated discussion not made for sports radio—about why violence against women and football seem to walk arm-in-arm. We could discuss the inability for football players to compartmentalize violence, taking the hyper-aggression of their sport home with them—something that affects families in the armed forces as well. There is a discussion we need to have about its connection to traumatic brain injury, and the ways that some of the side effects according to the NFL’s own neurologists, are mood swings, fits of temper and the inability to connect emotionally with the people in their lives. There especially is a discussion we need to have about a culture of entitlement that starts in high school and runs even more profoundly in college football, where young men produce billions in revenue and are often “rewarded”, since they can’t be paid, with a warped value system that says women are there to be taken. If we can confront how players deal with violence and with the women in their lives, then we can prevent tragedies before they take place. Unfortunately, the NFL has shown absolutely zero interest in taking this issue seriously. The league didn’t do anything after Kansas City Chiefs player Jovon Belcher killed the mother of his child, Kasandra Perkins, before taking his own life in front of his coach and general manager.If they did not do anything then, they are not about to take it seriously now. It is very difficult to not be cynical about why it is so casually indifferent to this issue. To discuss violence against women means by necessity to talk about everything endemic in the NFL that creates this culture. The NFL has been aggressively marketing its sport to parents, telling them that, despite what they may have heard, football is as healthy for their children as a Flintstones vitamin. To discuss the causes of violence against women means to put its golden goose under the harshest possible light. It means producing negative publicity, and it means blowing wind on the brushfire movement of young parents who do not want their children playing this sport. To not discuss it, however, means not only ignoring a problem that won’t go away. It means sending a message to every general manager, coach, player and fan that the worth and humanity of women is at best negligible. That is why when Rice’s coach John Harbaugh said, upon learning of Rice’s suspension, “It’s not a big deal, it’s just part of the process,” he is just taking his cues from the league that provides him with employment. Harbaugh also said, “He makes a mistake, all right? He’s going to have to pay a consequence. I think that’s good for kids to understand it works that way.” Unfortunately, the only lessons that kids are going to learn from this episode is that the vaunted “shield” of the NFL protects perpetrators of violence against women, for the sake of what it sees as the greater good. When its “breast cancer awareness month” begins, people should take these jerseys and light a big old bonfire outside of NFL stadiums. They are symbols of a monstrous joke that sees women as either revenue streams, cheerleaders or collateral damage to what takes place on the field.